What it doesn’t realise (or maybe it actually does) is there is also a Dream House movie with an almost identical storyline. Dream House follows a predictable story of a couple, Elena and Akin, who move into a big house they consider their dream house, only for a ghost to begin to move things around and appear to the wife. And while movies like this would readily come with a deluge of goose bumps to compensate, Dream House comes with very little, as it manages to lose its thrilling appeal by creating a story about a good ghost who is out for salvation. Did I just hear you yawn? There begins a back and forth about her husband’s disbelief, her screams, his disbelief, her screams. In all these, Dream House still has us holding our breaths in hope for some real explanation to moving things, slamming doors and playing pianos. Alas, it is hot air. The ghost is looking for vengeance just around her house and needs a human vessel, aka Elena, to make this happen. The first scene shows Elena having a bad feeling about the house, then suddenly seeing a plant and loving the house in the same breathe. Then she begins to get scared and starts snooping through her husband’s phone and asking questions about his exes, questions that ultimately lead nowhere. There is also the back and forth about where to place a picture that has no import on the story in the end. And the characters end up saying haunted house a few times. And perhaps we should also talk about the unexciting dialogue between the couple, how the wife who should be young and passionately in love seems always upset, and the husband who is portrayed as head over heels seems distant half the time. The ghost is reported to only live in the house, but when Akin takes Elena to a psychiatric home, there is our ghost, comforting her. Makes one wonder, if the ghost was so mobile, why didn’t it follow its killer just by the house to see where its body was buried. Suddenly, we find that Elena dies, and her daughter receives her ‘seeing’ gift. We don’t know why she died, we are just thrown into the dark future and left alone to grapple with it. Matilda Obaseki plays Elena, and is brilliant, especially with her fear. Femi Jacobs plays Akin and doesn’t talk clearly (Dear Femi, we are back here.). Together, they create a rather feeble chemistry. Kehinde Bankole plays Ene, the ghost, and for some reason, you can’t but wonder why she looks like a body covered in Nixoderm. The man who plays Ene’s husband is a terrible actor. The child actor could be better. 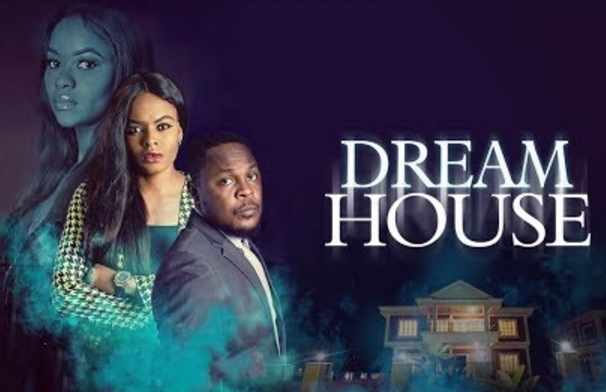 Written, produced and directed by Muyiwa Aluko, Dream House is long and indecisive. It decides against scaring you at some point and attempts to create mystery, but that also falls flat. Then it becomes a love story, but we already lost interest with the too many switches, we no longer pay attention. It isn’t all bad, however. The shots are everything. From Elena’s view from under the duvet to an amazing external shot of the house and sights of Lagos, the cinematography absolutely rocks.